Improved crop protection strategies are required to address the need for efficient use of resources and ensure food security. The soil-dwelling plant-parasitic nematodes are a major pest causing crop disease and yield loss. Root-knot nematodes, Meloidogyne spp., are among the most economically damaging soil dwelling plant parasites of agricultural crops. Current management practices are not economically or environmentally attractive and often rely on toxic nematicide applications. Therefore, research on sustainable strategies for nematode control is a priority. Successful management strategies could potentially be achieved by the combined use of natural enemies of nematodes, such as the biological control agent Pochonia chlamydosporia, a facultative egg parasite of plant-parasitic nematodes, and induction of natural defence mechanisms in plants. The fungus can saprophytically proliferate in the rhizosphere using nutrients present in root exudates and infect nematode eggs but is not able to prevent the initial infection of roots by nematode infective juveniles which can itself be achieved by priming plant immune defences. The application of P. chlamydosporia, combined with the exploitation of the natural mechanisms of plant defence, is a biomanagement alternative under study. The activation of specific plant biochemical defence pathways might produce changes that promote the fungal transition from the saprophytic to the parasitic phase. 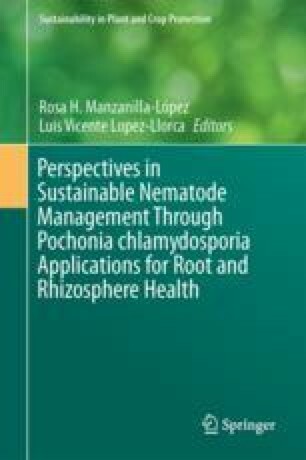 The main goal of this chapter is to unravel the role of induced plant defence responses as a putative resource to enhance the potential of P. chlamydosporia as a biocontrol agent against root-knot nematodes.